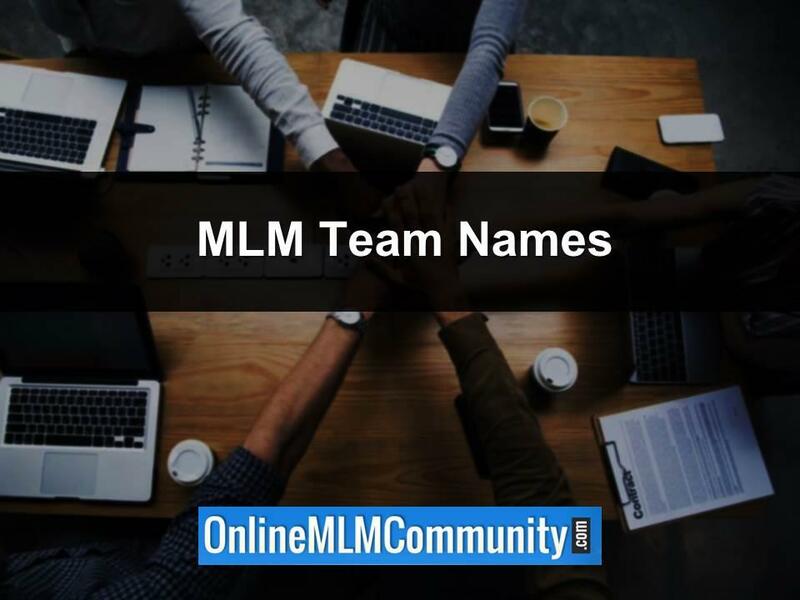 What are the most common MLM Team Names and what should you know about them? Should you give your downline a name? If so, what name should you pick and why? In today’s post, I want to share my personal views about giving your network marketing team a name. Let’s get started. I’ve found that everyone wants to belong to something greater than themselves. It’s just human nature to feel that way. Everyone wants to be part of a team; especially a winning team. Belonging to a team gives people purpose, identity and a sense of belonging. It makes us feel good. I can’t speak for you, but some of my best memories in life were when I was part of a great team. This includes youth sports, fraternal organizations, the military, and countless other things. Look at your own life for a moment. Think about your fondest memories. Chances are, they involved other people, not just your family. Chances are you were part of a team. Network marketers want the same thing.They want to belong to something greater than themselves. They want to be part of a team. People in our industry get excited about belonging to a winning team. Don’t you? When you go to your company’s events, isn’t it neat to see the different teams? Some teams have a custom hat, or a custom shirt, or a flashlight, or streamers, or something else that differentiates them from every other team in the company. When you see the person walking around, you know what team they are affiliated with. The company itself is also one team. But within the company there are many different organizations and smaller teams. Everyone you sponsor is part of your team. You are also part of your sponsor’s team, and their sponsor’s team. If you have a downline (of any size) you should consider giving it a name. Sound crazy? I don’t think so. If anything, I believe it will help improve the morale and motivation within your team. It will motivate people, excite them and create enthusiasm in your group. This is just a small sample of MLM Team Names you could give your downline. You could also include your first name and/or last name as part of the team name, although I don’t recommend that. Instead, I recommend you use something a little more generic, so it appeals to more people. Remember, it’s not about you; it’s about the team! When your downline has a team name, you can introduce new distributors to your team. This will give them a sense of belonging and a little extra excitement. I think so anyway. You can even have shirts, certificates, bumper stickers, stationery, business cards, letterhead, pens, and other promotional items made up for your team. You could give away these items for free to new team members, or as prizes with team competitions. In addition, you could create a team website using your team’s name. You could put password protected training materials on the site. You could create training videos and profile successful people on your team. All things aside, I think it’s much better to have a team name than not have one. If your upline has a team name, you should go with that initially. But, if you plan on being a leader yourself, I suggest you pick your own team name right from day one in the business. It’s a great way to differentiate yourself and create your own team culture. The sooner you set-up your own team, the better. During my time in Amway, I belonged to the World Wide Dream Builders. That was our line of sponsorship, system and team name. At the time, I felt very proud to be affiliated with that team. Our team had large events and business meetings with its members. It was always fun and exciting to be around other members in the team. There was a great esprit de corps among the members. At the events we would have cheers, celebrate people’s success, and focus on the team. People outside of the network marketing industry might think this is a little bit crazy. I don’t think so. Think about how people rally behind their favorite sport’s team. They buy the team’s jersey, go to the events, and enjoying hanging out with other people who like the same team. I believe it’s just part of our human nature; how we are hard wired, to want to be part of a team. In summary, MLM Team Names are a very effective way to improve morale and enthusiasm in your downline. I’ve found that people like to belong to teams; especially a winning team. If you have a downline of any size, you should create your own team name. If you are just getting started with your network marketing company, you should find out if anyone in your upline already has a team name in place. You could “plug in” to their team and utilize their resources or just create your own MLM team name from scratch. What you do is totally up to you. Just keep in mind if there is already a team in place, there’s probably no reason to reinvent the wheel. On a side note, what is your MLM Team Name? Mine is the Rock Stars. Leave a comment below and let us know what you think. I look forward to hearing from you. Have a great day. Without a doubt, having a team name is very important to your success in network marketing. Don’t make the mistake of thinking you need a big team before you can pick a name. Come up with one as soon as possible. When people join your team, introduce them to the team and make them feel important. Send them something with your team name on it, like a coffee mug. When you do awards each month, print certificates with your team name on it. Just get creative. These are great ideas, Nick. Thanks for sharing. I do a certificate for my own team, for several different things, such as rank advancements, distributor of the week, etc. I had a logo made up with my team name on it and that goes on every single certificate. People love getting these things. They hang them on the wall in their office, share photos of them holding the award on Facebook, and countless other things. Anything you can do to make people feel like they are part of a team will definitely help with morale and retention. 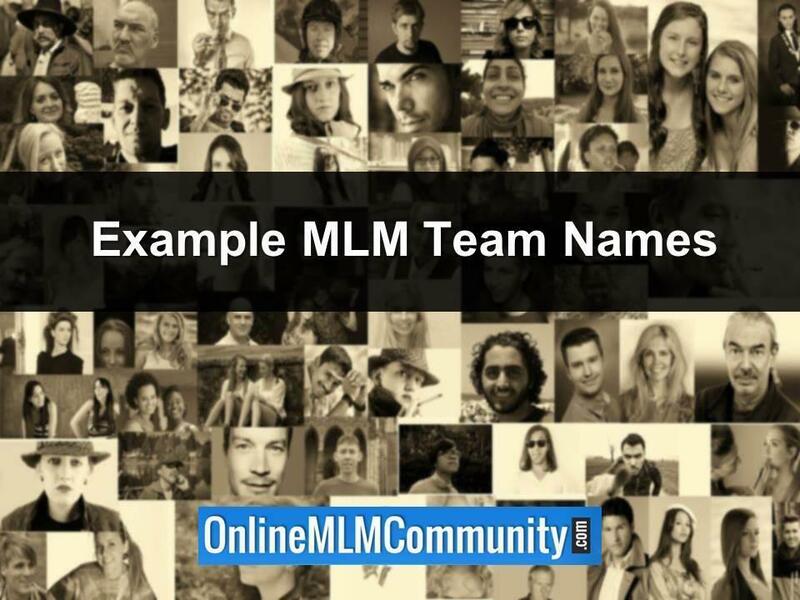 These are some great ideas on naming your MLM team. What you said really makes sense to me. People want to be part of something greater than themselves. Creating that team spirit is very powerful. It can unite people to work together, give them a sense of belonging, and create a strong team culture at the same time. You are spot on Beverly. Every MLM Team needs a good name. Follow the advice in this article and you really can’t go wrong. I agree. It’s all about team spirit. Anything you can do to improve the team spirit is worth doing. Yes, whenever you can get “buy in” from your team on your team name, it makes it even more powerful. I suggest people without a team name brainstorm a few ideas and then take a poll with their team to determine which one will be the best fit. Those are both great ideas for a MLM Team Name. I never would have thought of them myself. I think having a unique team name is a great way to go. As our company went into pre-launch, I asked my personally sponsored associates to come up with name suggestions and then I had everyone vote. Our team name is Genusity Team Freedom! That’s a great team name, Beverly. When you get the buy in from your team members, it’s even more powerful. My team in my MLM Company is the Rock Stars team. I try to do whatever I can to make everyone feel important and feel like they are part of something bigger than themselves. We do events, recognition, contests and much more. When I look back to other MLM Companies I have been in, the companies I did the best with were the ones with a great team culture. Great post, and I agree with you. Developing a team name and culture is something that works really well. I tried to avoid it for some time, but slowly came round to the fact that it could only enhance our business building efforts when everyone in the group could actually associate themselves with not only other distributors in the company, but those that are also part of their ‘team’, whether downline or crossline. Everyone wants to be part of something greater than themselves. This is why the companies that grow the fastest and biggest are the ones with ROCK SOLID cultures. When I think of Amway, Herbalife, Nu Skin, Mary Kay and Forever Living, they all have a team culture where people are encouraged to grow, recognition is provided and the events are powerful. Also, many of those leaders have team names for their groups. They do contests. They have special jargon. They have shirts for their team. They take trips together. Good to know that you finally realized the importance of team work. When people work together, anything is possible. Network marketing is definitely a team sport. My team will The Dreamweavers. Should read; my team will be The Dreamweavers. Great name, Rick. What does it mean? How did you come up with it? This is great! Naming my team was the first thing I did :-). I agree with you saying that everyone wants to belong to something. We had Tshirts made up with our name and city on them and our teamed loved them!! I like your suggestions on names too. You want to establish a brand name for yourself: an inspiring, respectable name. You want your name to be something that won’t embarrass you if you make it big. If you name your team as a joke to make yourself laugh, guess what? Other people are going to find it ridiculous too. How many rock bands gave themselves a totally absurd name that they had to change once they found main stream popularity? Greg’s (above) point about people wanting to join a team just because they like the name (whether that is a conscious motivator or a subconscious one), is a great one. Sound like a winner, and you will attract other winners. Picking a good name can make all of the difference. The name of my team is Team Freedom and it seems to work pretty well. Yes, you are absolutely right in really considering how that name will stand down the road. I believe it works well to have many people all throw in their ideas. I recently came across a website that is a contest-like site where companies put up a prize of $100, $200 up to $500 for people to come up with product or company names. This provides a system in which you have many minds all giving ideas. I believe it is called Squad help or something like that. That’s a great idea to get input from your team members about a team name. That way everyone has buy in and feels like they were part of the process. Do you need to register your team name with your state as an LLC? Great question. My answer is no. It’s just an informal name you use for your group. I am in full agreement with having a team name for your MLM. The thought process behind T-shirts, E-books and other training materials with your copyrighted team name can be another income system. I also see where building websites around this team name will give you another advantage. The other fact of human kind is the same reason sports teams are so popular. People follow names. If you find a catchy name, I believe you will gain people who join just because of the team name. They will want to be winners because they want their team to win. Yes, a team name makes great sense. The main thing is to get creative. Everyone wants to belong to something greater than themselves.